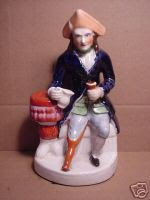 Staffordshire figures were made of a huge variety of subjects, including cottages, animals, birds, politicians, military figures, sailors, actors, royalty, saints, cricketers and even murderers. Each figure tells a story. What will you collect? Sleeping spaniels, largest is 9+ inches wide, c1860. It might take you a lifetime to collect a pack of these rare figures, but they look great napping by your hearth. The American Fireman figure came in three sizes, from just over 4" to just under 9". Often this figure was called a Canadian Fireman in the U.K., probably because it wasn't an English uniform so they guessed Canadian. 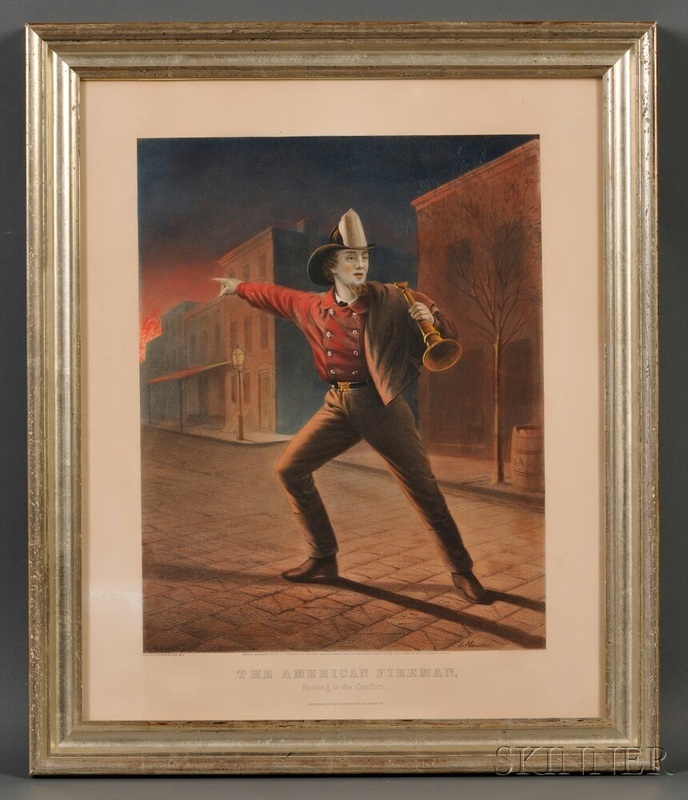 But recently a Currier and Ives print, dated 1858 and titled AMERICAN FIREMAN, was sold at Skinner (for $1100); I think it's the source material for the figures. Don't you agree? PAUL PRY was a huge hit in London, three acts, opened in 1825 and ran more than 100 performances. John Liston appeared as Paul Pry and Madame Vestris also acted and sang in the production. Liston wore Hessian boots, top hat and striped pants and his performance was so popular that his image appeared on snuff boxes, shops, signs and handkerchiefs! The two figures at the left are Lubin Log, another famous role for John Liston. c. 1854. G.S.Charles while at Christie's London wrote that the hospital had strict rules and that all working sailors had sixpence/month deducted from their wages to support the Royal Hospital. Did you know that the Royal Navy was always paid with gold? Chelsea Pensioner, figure of a retired soldier. Looks great with the peg leg Greenwich Pensioner, but they are not a true pair, as the bases don't match perfectly. Again, 8 inches tall. The print below titled 'Cavalry and Infantry' with the Royal Hospital Chelsea in the background. You are looking at a painting by Sir Edwin Landseer showing the famous American lion tamer Isaac Van Amburgh coaxing the fierce and large lion to lie down with the lamb as the highlight of his London circus act. This performance was Queen Victoria's favorite and she often took her family to the London circus. The potters did many circus figures because the posters served as wonderful source material, so here you see the Van Amburgh performance translated into pottery! These seated lions are almost a foot tall and you can see the little lambs lying at the lions' feet. Produced in the late 1840s the pair is $5995. 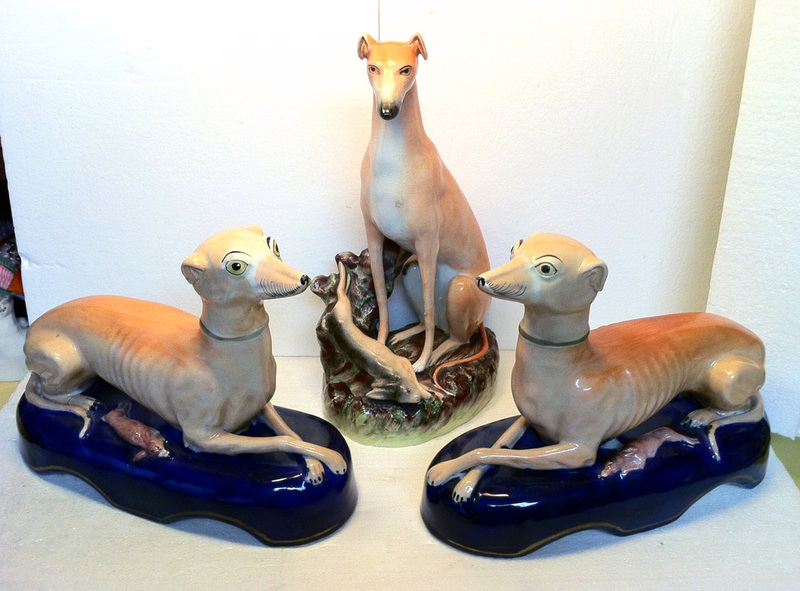 the tallest (12") greyhounds ever manufactured in the potteries. Wonderful examples c. 1855 with best gold, crisp modelling and very rare. These models are called greyhounds in Pope's A-Z Book but many references call the tall ones whippets. Up to you! These figures were manufactured in the 1850s by the Thomas Parr pottery. 14-15 inches tall. 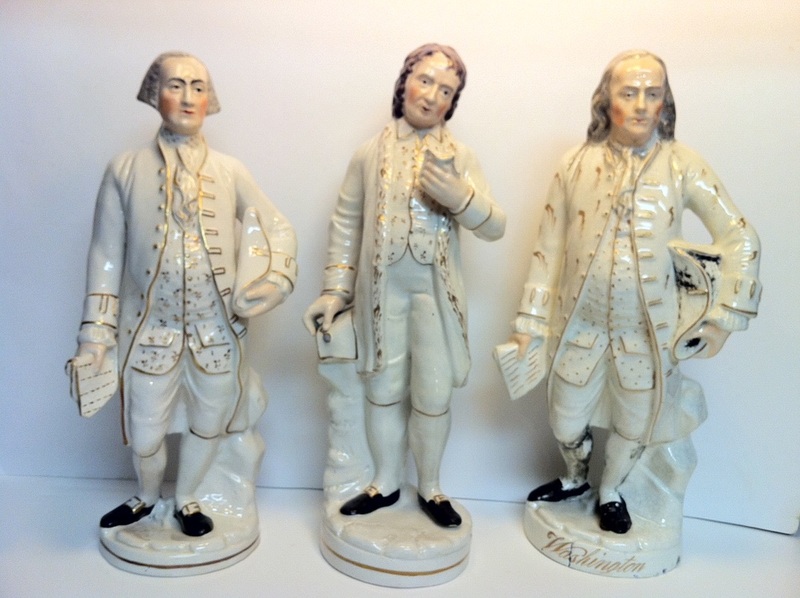 You know the Benjamin Franklin figure at the right; this figure was titled Franklin. 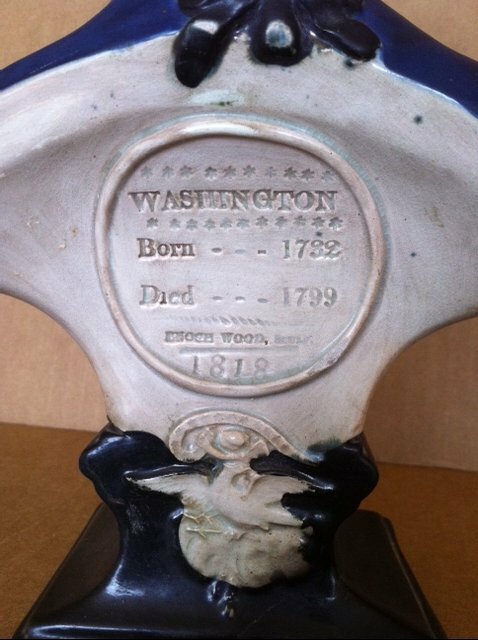 and Washington. so that the same mould could be used twice, saving money for the frugal pottery. 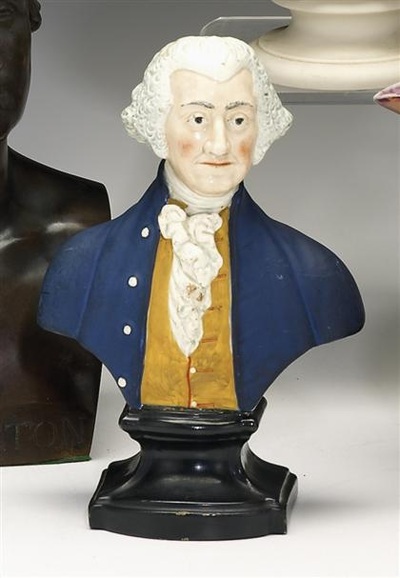 You know the George Washington figure at the left, which is extremely rare, but obviously it is George and was potted as George. 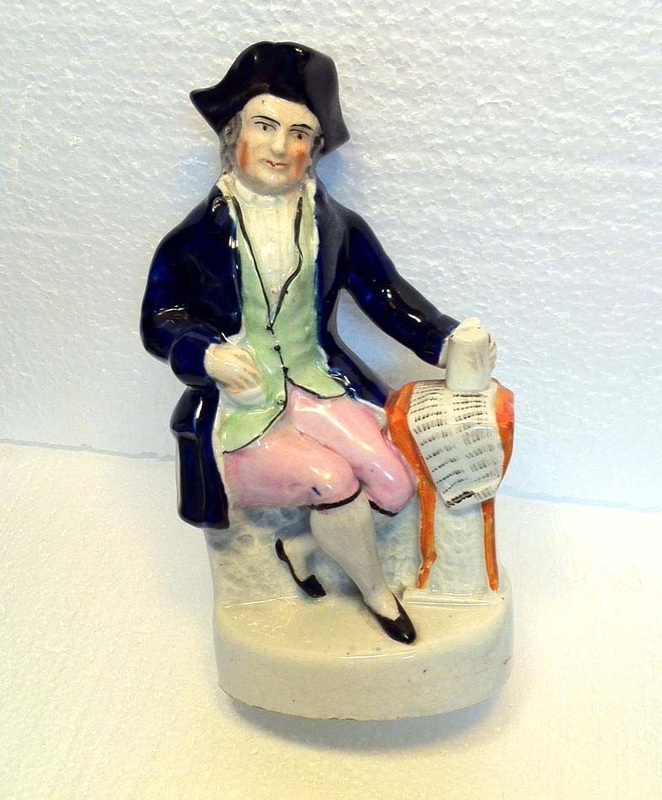 You probably have never seen the middle figure which is a really rare figure, the rarest of the three, Thomas Jefferson.